Bluefin Bay 14A is a luxury upper level unit at the Bluefin Bay Resort in Tofte, MN. Bluefin Bay 14A is located on the left side of the larger Bluefin 14 unit. Save money by renting only what you need. Gorgeous views of the Tofte Dock are yours to enjoy from your balcony at Bluefin Bay 14. Walk right down to the water`s edge on the shared ledge rock shoreline. Enjoy open layout living in Bluefin Bay 14A. The upgraded kitchen is the perfect spot to prepare a home cooked meal. Enjoy the dishwasher during your stay and don`t worry about hand washing dishes on vacation. The full sized appliances make preparing meals a breeze. Love coffee and tea in the morning You will love the Keurig and selection of coffee and teas included with every rental. Enjoy your meals on the dining room table. Large windows in the living area lets in plenty of natural light and provides amazing Lake Superior views. Out of the window`s you will see nothing but Lake Superior. Sit back and relax in the cozy living room. Watch a movie on the flat screeen TV and never miss a moment in this open layout living area. The gas fireplace is perfect for curling up with a good book on a cold winter`s night. View of the living room area from the loft bedroom. The loft bedroom has two twin beds. There is also a flat screen TV in the loft bedroom. Curl up for a good night`s rest in the unit`s bedroom. The bathroom has a walk-in shower and large vanity. Sit out on the balcony and watch the sun rise over Lake Superior. Bluefin Bay 14A is just steps away from the Lake Superior Shoreline so you get beautiful unobstructed views. Plus take in the remnants of the historic Tofte Dock. Bluefin Bay 14A is located on the upper level in a building located near the restaurant and indoor pool. There is a playground and even a soccer field you can enjoy during your stay. Light a fire in the community firepit and roast marshmallows. HIGHLIGHTS: Now you can enjoy top-drawer *Premium Home* comforts AND Bluefin Bay Resort ambience – in the same vacation stay. Home 14A has a kitchen! 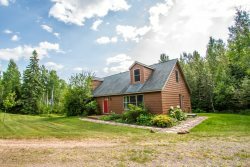 Plus living/dining great room, fireplace, 2 luxurious extra-long twin beds in private loft, sofabed, a deck overlooking Historic Tofte Pier, plus air conditioning. Specially priced direct-from-owner, thanks to independent owner control (no resort fee). Resort's indoor/outdoor pools & hot-tubs included. Uniquely decorated & furnished with owners' personal touch. Just steps from the rocky shoreline. Guest Appreciation Coupons included (first-time guests get $25 or $35 for 3 nights, increasing nightly to $185 or $270 6 nights; return guests get $65 or $95 for 3 nights, increasing nightly to $350 or $270 6 nights; possibly less if booked under specials); each additional night brings exponentially increased $$. See ** for Coupon example. Coupons good for bikes, canoes, kayaks, golf, off-site spa services & charter fishing; fine dining; shopping; & in season skis, boards, snowshoes and more. REST OF THE STORY: Home 14A is ‘west half’ of home 14 (one of only 3 *Premium Homes* at Resort). 14A is somewhat comparable in size, but higher value, to a style Bluefin Bay Resort’s system labels “Studio with Loft.” But it definitely has a guest-friendly "look & feel" of its own. Some guests find a practical fit with the private-loft’s 2 XL single beds (cozy sky-light view of the stars! ); sofabed, too, if needed (but never add’l person charges in 14A). Custom locally-made furniture through-out for nice fit, unique styling. Relax on "pondering-seat" at large window overlooking Lake & Historic Tofte Pier, stone's throw away. Or lounge on deck & relish sounds of waves. 3 ceiling fans. New AC. 2 HD TVs. Freshly remodeled, top to bottom. Amenities galore: Famous Keurig single-cup-perfect coffee. Famous K-cup flavors, all you want. World-class sachet teas & hot cocoas. Bountiful bedding. Luxurious linens. Surprisingly splendid! We loved staying at this property. The beds were comfortable, the kitchen was well supplied and the view was great. The outdoor hot tub and the walk along the lake to get to it was our favorite part. Excellent location across from the pool. Great view comfortable beds. We loved 14A! It was very clean and updated. The location was wonderful with a beautiful view. Comfortable beds with fans above. The only thing that we would change was the temp in the room. We turned the fireplace off (there was still warmth coming from it with it turned off) and the temp all the way down. We had the fans on, but it was still warm while we slept (we like it pretty cool for sleeping). Next time, we will ask how best to keep it cool.